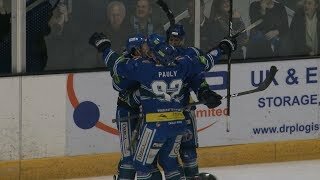 The Genting Casino Coventry Blaze produced one of their finest performances of the season to beat the Manchester Storm 1-4 and claim qualification for the post-season playoffs. The Storm, who were playing their final game of the season, sat one point ahead of Blaze on puck-drop, meaning Coventry went into Altrincham needing to win or their hopes of an 8th placed finish and playoff place would be over. It began perfectly for Blaze and their large contingent of travelling supporters as their top point and goal scorer vs. Manchester this season Tim Crowder gave them a 0-1 lead with his 27th league goal of the year at 3.02. Great Britain forward Luke Ferrara then made it 0-2 rushing up the ice and firing quickly past Matt Ginn in the Storm goal. It was his fifth straight away game with at least a point. Luke Moffatt then got Manchester on the board, showing good speed to get past the Blaze defence, beating Coventry’s Man of the Match Matt Hackett in close for 1-2 (14.53). In the second period, a nice passing move between Crowder and Shawn Pauly led to 1-3, Pauly registering his 22nd of the season at 23.44. With Hackett outstanding in Coventry’s net, stopping 33 of 34 Storm shots, Storm coach Ryan Finnerty was left with no choice but to pull his goalie for the extra skater to try and rescue the season. 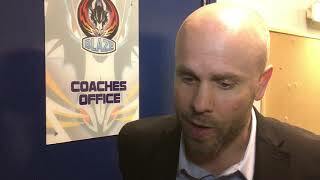 It wasn’t to be though as Blaze Captain Kevin Morris scored into the empty net (57.59) for a final score of 1-4, securing Blaze a post-season playoff spot against the league winners, either Cardiff Devils or Belfast Giants. Congratulations to @covblazehockey coach Danny Stewart. We wish Danny and the organisation all the best in the playoffs. Thank you to our fans - you were magnificent! !